Went in relatively easily. The chain was a pain to attach...very difficult to bend, but other than that it was simple, and looks great! Instructions were pretty clear and easy to follow. 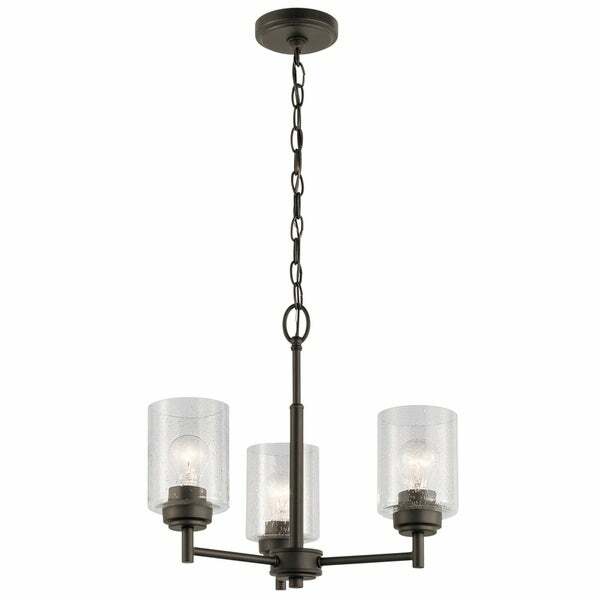 This Winslow collection 3-light mini chandelier features an olde bronze finish that will complement many transitional decors. Clean lines of the steel frame add interest while the clear seeded glass shades allow the light to bounce in different ways giving a unique look for many spaces. Olde Bronze finish with Clear Seeded Glass shades. Can be installed with glass up or down. Includes 36 inches of chain and 62 inches of wire so it can be hung at your desired height (up to 53 inches). Dimensions: 15.25 inches high x 18 inch diameter. Dimensions 18.0 In. X 15.25 In. Installed this light in my kitchen above this table. 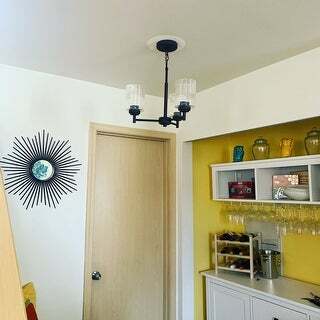 I wanted something a littler more modern and industrial looking than the outdated fixture I had. It was easy to install and looks great.